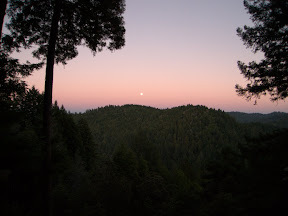 Though I’ve previously posted about our stay in Guerneville, I’m finally getting around to posting a few more notes about the trip I’m calling the “Great Get-Away” for 2010. The trip started with Kem and I heading to the Sonoma area with friends Jim and ML and hanging out for a long weekend in the hills above the Russian River. From that home base, we ranged down to Tomales for the Holestein 100 bike tour and up to Healdsburg and the Santa Rosa area for wine. The house we rented was pretty nice. In addition to the view we couldn’t get enough of, you can see a shot of the back side and patio/pool in the post here. If you look close you’re see Kem lounging by the pool. The picture of the wine was from Oakville grocery in Healdsburg. We stopped in there for a midday lunch. They make great sandwiches there. It’s right on the square in Healdsburg. It was well over 90 degrees that day and the rose wine hit the spot. The other picture is another of the hills above the Russian River in Guerneville. We were blessed with some really great weather while we were there – as well as a full moon. I took this picture one evening from the deck of the house we rented. Porter Creek Porter Creek was the first place we visited for no other reason than it was one of the first up Westside road that we happened upon. That and it looked so quaint. It’s a very small place. There’s a cute little house surrounded by flowers and around the side is a very small tasting room. Maybe because it was the first we tasted I wasn’t blown away by the wines, but I do remember the Zin being excellent. Thomas George A little bit further up Westside Rd we found Thomas George. This winery was a fair bit more upscale than the much smaller Porter Creek. Tasting are in a big wine cave. I was a big fan of their Viognier and we returned here on the way back to the house to pick one up. Hop Kiln Hop Kiln was interesting not just for the old building they do the tastings, but also for all the other things you could taste in addition to the wine. There were mustards, oils and vinegars and someone was making and handing out samples of a chicken salad dish that was great. Unfortunately, I don’t remember anything remarkable about the wines. Maybe it’s because I was too busy tasting everything else. Alderbrook Alderbrook had some tasty Zins. Harvest Moon Harvest Moon had some of my favs of the trip. We ended up getting the Russian River Zin and a Cabernet that we later enjoyed at the rental house. Hook & Ladder These wines are from the folks that used to make wines under the De Loach label. Small, family run, the name comes from the fact Cecil used to be a San Francisco firefighter in 1970. Wines were good and prices much better than most we tried in the area. Ledson Ledson is what I call a Disneyland winery. It’s very showy and there’s something artificially showy about it. Tastings (and clearly other events) are done in the Ledson castle. Tastings are correspondingly expensive. $15 for 6 wines, $20 for 9 wines. We opted to pass on the tasting. They do, however, have a great market right in the castle and they make some great sandwiches. We had a picnic under the trees on the park-like grounds. Don’t bring your own picnic basket of food though, you can only eat food there that you buy there. If you bring your own food or wine the very visible security staff is liable to throw you off the property. Matanzas Creek Matanzas Creek was probably my favorite of the bunch we tried. In some ways this place is probably just as upscale as Ledson but they’ve really done a nice job with the property. The lavendar fields that surround the place are not just for show. They actually harvest the stuff. It smelled great as we wandered around their garden. All the wines I tried were great. Not to be overlooked at this place was the fact that the guy helping us with tastings was very knowledable and friendly. I even remember his name: Ira. He really knew their wines and the area. In fact, I googled for Ira at Matanzas Creek and sure enough, I’m not the first person to notice how helpful Ira was. Don’t miss Matanzas Creek.